The 6 January Dictatorship (Croatian: Šestosiječanjska diktatura, Serbian: Шестојануарска диктатура/Šestojanuarska diktatura, Slovene: Šestojanuarska diktatura) was a royal dictatorship established in the Kingdom of Serbs, Croats and Slovenes (Kingdom of Yugoslavia after 1929) by King Alexander I (r. 1921–34). It lasted from 6 January 1929, when the king prorogued parliament and assumed control of the state, and ended with the 1931 Yugoslav Constitution. Alexander abolished the Vidovdan Constitution, prorogued the National Assembly and introduced a personal dictatorship on 6 January 1929. The next day, General Petar Živković became prime minister, heading the regime's Yugoslav Radical Peasants' Democracy. On 11 January, the State Court for the Protection of the State was established in Belgrade. On 20 April, the Croatian fascist Ustaše and Macedonian secessionist IMRO called for the independence of Croatia and Macedonia. On 25 April, Đuro Đaković, a prominent unionist and the first secretary of the Communist Party of Yugoslavia, was killed by Yugoslav policemen at the Yugoslav-Austrian border, Slovenia, after four days of torture and interrogation in a Zagreb police station. On 3 October, the state was renamed to the Kingdom of Yugoslavia and was divided into new administrative divisions, called banovine (singular banovina). On 22 December, Croatian leader Vladko Maček was arrested. After Alexander was assassinated, he was succeeded by the Yugoslav regency. 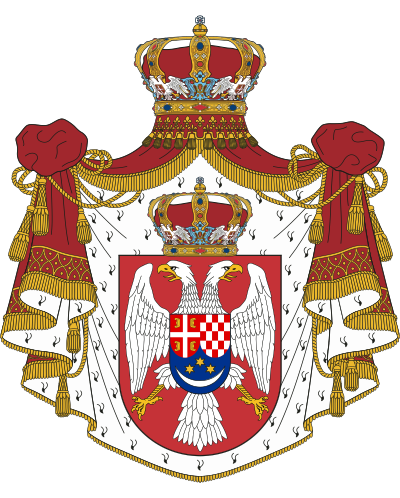 The Banovina of Croatia or Banate of Croatia (Serbo-Croatian: Banovina Hrvatska / Бановина Хрватска) was an autonomous province (banovina) of the Kingdom of Yugoslavia between 1939 and 1941. It was formed by combining the Sava Banovina and Littoral Banovina, but also with small parts of the Drina, Zeta, and Danube banovinas. Its capital was Zagreb and it included most of present-day Croatia along with portions of Bosnia and Herzegovina and Serbia. It included area of 65,456 km2 and had population of 4,024,601. The Ban of the Banovina of Croatia during this period was Ivan Šubašić. The Danube Banovina or Danube Banate (Serbo-Croatian: Dunavska banovina / Дунавска бановина), was a banovina of the Kingdom of Yugoslavia between 1929 and 1941. This province consisted of the geographical regions of Srem, Bačka, Banat, Baranja, Šumadija, and Braničevo. The capital city of the Danube Banovina was Novi Sad. The province was named after the Danube River. The Drava Banovina or Drava Banate (Slovene: Dravska banovina), was a province (banovina) of the Kingdom of Yugoslavia between 1929 and 1941. This province consisted of most of present-day Slovenia and was named for the Drava River. The capital city of the Drava Banovina was Ljubljana. The flag of Yugoslavia was the official flag of the Yugoslav state from 1918 to 1992. The flag's design and symbolism are derived from the Pan-Slavic movement, which ultimately led to the unification of the South Slavs and the creation of a united south-Slavic state in 1918. The flag had three equal horizontal bands of blue, white, and red and was first used by the Kingdom of Yugoslavia from 1918 to 1943. A red star was added in its center by the victorious Yugoslav Partisans in World War II and this design was used until the breakup of Yugoslavia in the early 1990s. Today, the flag still holds meaning to those nostalgic of Yugoslavia. The Morava Banovina or Morava Banate (Serbian: Моравска бановина / Moravska banovina), was a province (banovina) of the Kingdom of Yugoslavia between 1929 and 1941. This province consisted of parts of present-day Central Serbia (including Vučitrn and Podujevo in Kosovo) and it was named for the Morava Rivers. The capital city of the Morava Banovina was Niš. The "National anthem of the Kingdom of Yugoslavia" (Serbo-Croatian: Химна Краљевине Југославије / Himna Kraljevine Jugoslavije, lit. "Yugoslav National Anthem") was created in December 1918 from the national anthems of the Kingdom's main three constituent historical provinces: Croatia, Serbia and Slovenia. In those times the official authorities considered the three nations, Croats, Serbs, and Slovenes as one nation with three names. The official language was thus called the Serbo-Croato-Slovene language. The orders, decorations, and medals of the Kingdom of Yugoslavia were inherited from the Kingdom of Serbia and also established during the Kingdom of Yugoslavia period from 1918 to 1945. The Parliament of Yugoslavia was the deliberative body of Yugoslavia. Before World War II in the Kingdom of Yugoslavia it was known as the National Assembly (Narodna skupština), while in the Socialist Federal Republic of Yugoslavia the name was changed to Federal Assembly (Serbo-Croatian: Savezna skupština/Савезна скупштина). It was the official deliberative body of the Yugoslav state, which existed from 1918 to 1992 and resided in the building which now convenes the National Assembly of Serbia. The subdivisions of the Kingdom of Yugoslavia (initially known as the Kingdom of Serbs, Croats, and Slovenes) existed successively in three different forms. From 1918 to 1922, the kingdom maintained the pre-World War I subdivisions of Yugoslavia's predecessor states. In 1922, the state was divided into 33 oblasts or provinces and, in 1929, a new system of nine banates (in Serbian and Croatian, the word for "banate" is banovina) was implemented. The Vardar Banovina, or Vardar Banate (Macedonian: Вардарска бановина, Vardarska banovina; Serbian: Вардарска бановина / Vardarska banovina), was a province (banate) of the Kingdom of Yugoslavia between 1929 and 1941. The Yugoslavia national football team represented the Kingdom of Yugoslavia (1918–1941, until 1929 as Kingdom of Serbs, Croats and Slovenes), and the Socialist Federal Republic of Yugoslavia (1943–1992, until November 29, 1945 as Democratic Federal Yugoslavia, 29 November 1945–1963 as Federal People's Republic of Yugoslavia) in association football. It enjoyed success in international competition. In 1992, during the Yugoslav wars, the team was suspended from international competition as part of a United Nations sanction. In 1994, when the boycott was lifted, it was succeeded by the Federal Republic of Yugoslavia national football team. The Serbia national football team inherited Yugoslavia's spot within FIFA and UEFA and is considered by both organisations as the only successor of Yugoslavia. The Zeta Banovina or Zeta Banate (Serbo-Croatian: Zetska banovina / Зетска бановина), was a province (banovina) of the Kingdom of Yugoslavia between 1929 and 1941. This province consisted of all of the present-day Montenegro as well as adjacent parts of Central Serbia, Croatia, Kosovo and Bosnia and Herzegovina. It was named for the Zeta River which also gave its name to the medieval state of Zeta that roughly corresponded to modern Montenegro. The capital city of the Zeta Banovina was Cetinje.